At any given moment of any given day, we may come into contact with our patients and their families. At that moment, we represent Dr. Donato and our entire reputation as an office is in our hands. We are helpful, friendly, and confident in our services. We strive for excellence! We are the “CLEAR” choice for perfecting your smile – we use practically invisible braces and aligners, no metal! We are completely impression-free with the new iTero Element digital scanner. No more gooey impressions! We react quickly to questions and problems that you may have. We smile; it is our pleasure to serve you, our patient. We have a positive attitude and we are all proud of our office. All staff members are knowledgeable in orthodontics. If we can’t answer – your questions we will find someone who can. We are happy to answer questions you may have, even over the phone. We provide our patients with the highest quality orthodontic care available in a friendly, yet professional environment. Getting to know you and meeting your individual needs are our foremost concerns. 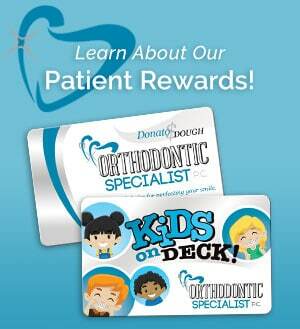 Dr. Donato is a board certified orthodontist with more than 25 years of orthodontic experience. You can always count on his personalized attention at each visit. Our administrative staff and clinical assistants are long-term employees with combined orthodontic experience of almost 75 years, and it shows in their expertise. We know our patients by name and cater to their personal needs. Our office is technologically advanced in the field of orthodontics. We offer digital photographs as well as Digital X-rays and Digital Patient Charts at your new patient exam, ready for you to view and take home immediately. We are very excited to be an Aesthetic office… clear brackets and Invisalign. Our patients can be assured that we follow all of the OSHA guidelines for sterilization techniques. We offer flexible in-office financing that is interest-free, as well as zero down payment options. We also accept some insurance plans. Orthodontic treatment is a long-term process. Knowing this, we strive to make your orthodontic treatment in our office a positive experience. We believe that the “customer always comes first!” Getting to know you and meeting your individual orthodontic needs are our foremost concerns.